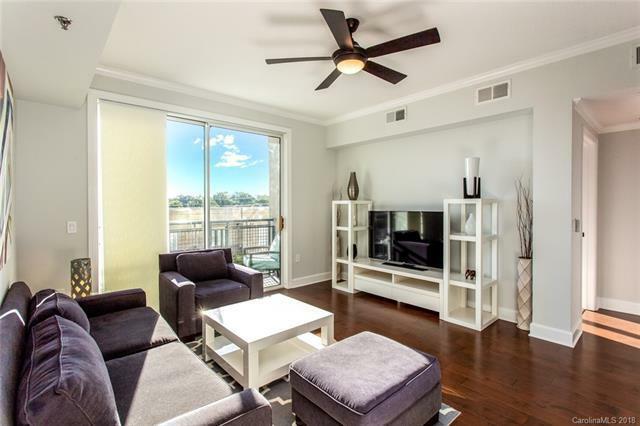 A short walk to downtown Charlotte, this condo has a city view from the rooftop deck that can't be beat! Eat in kitchen with granite, stainless steel appliances, updated white cabinets, breakfast bar and pendant lighting framed by crown molding overlook living room with balcony access that overlook courtyard. 2 bedrooms on a split plan for guest privacy including master with huge custom closet and en suite tile bath with seamless tile shower. Second bedroom with custom closet and full tile bath with granite vanity. This unit is on the same floor as the fitness center and roof deck for easy access and has storage unit. The building is pet friendly and a short walk to shopping, dining and entertainment!